Text below, with link for images at bottom, but The Bottom Line is that Field Day is all about making do with what one has to work with! Everyone will be dealing with this just like us. IF we had to deploy, it wouldn’t matter if there was a CME, Solar Peak, or static crashes from thunderstorms 100 miles away, those are the conditions which we’d be working with, and we would MAKE IT WORK! Setup is at 8am. There’ll be pastries there just like Club Meeting days. And coffee. And water, and other stuff. We push the transmit button for real at 1PM CDT and operated until 1PM CDT Sunday. We need operators, helpers around meals, loggers, GOTA Mentors (contact me! ), and Middle Of The Night Owls for overnight 80 and 40meter contacts. Tear down begins promptly (or a little earlier) at 1PM Sunday. We need just as much help then, if not more, than we do during setup. Temps will be a very un-Field Day like mid-80s both Saturday and Sunday, so bring your gloves, hats, and sunscreen, and come on out! 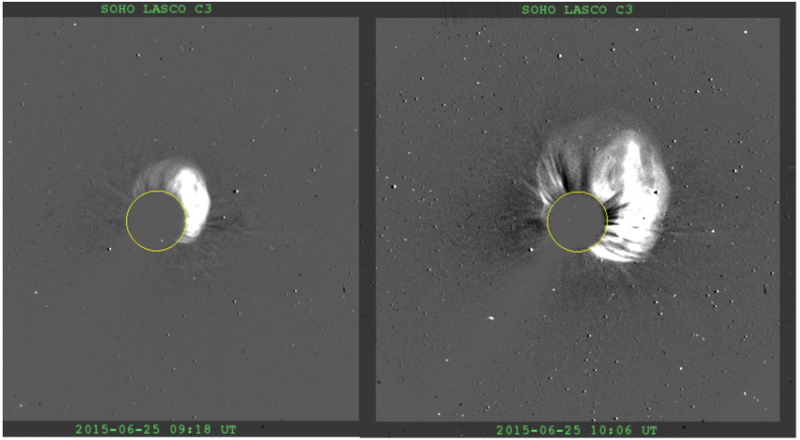 Yet another Earth directed coronal mass ejection erupted from the Sun this morning. Modeling of the event predicts arrival June 27 at 1700 UT (13:00 EDT). This event is expected to be weaker than the severe geomagnetic storm from earlier in the week. SWPC forecasters are calling for Moderate (G2) geomagnetic storm conditions beginning June 27 and continuing into June 28. The attached image, courtesy of NASA/ESA SOHO/LASCO shows the coronal mass ejection erupting from the Sun in two images taken about 45 minutes apart. In that time, the ejection traveled about 2.5 million miles. via The Sun produces yet another Earth-directed event | NOAA / NWS Space Weather Prediction Center.